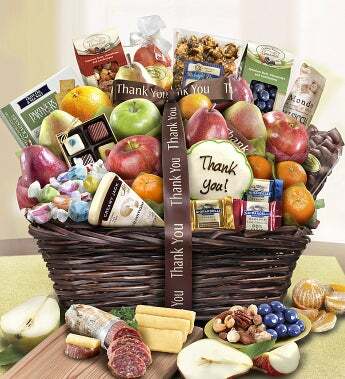 Show your true appreciation with this impressive Thank You taste sensation! This handsome walnut stained sturdy willow basket is fabric lined, tied with a Thank You ribbon and filled with fresh fruit, nuts, snacks, chocolate and other candies. Show your true appreciation with this impressive Thank You taste sensation! This handsome walnut stained sturdy willow basket is fabric lined, tied with a Thank You ribbon and filled with plenty of fresh fruit, nuts, snacks, chocolate and other candies.